The always innovative Camp 7 line is descendant of the Alp Sport and Alpine Designs lines conceived by founder George Lamb of Boulder Colorado in the 1970s. 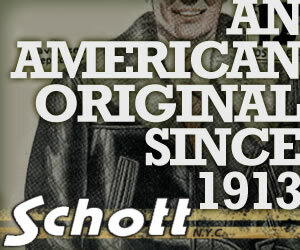 This coat is exemplifies the company’s innovative spirit in the cut and construction of this outdoor staple. Notice specifically the construction of this coat around the arms. Where many competitors would join the torso with the arms in simple perpendicular fashion, the Camp 7 design utilizes a more complex design that includes additional quilting to form a more contoured fit and eliminates a hard shoulder seam. Additional details including the internal seam finishing in black along the back and front panels reduces fraying on high friction areas. 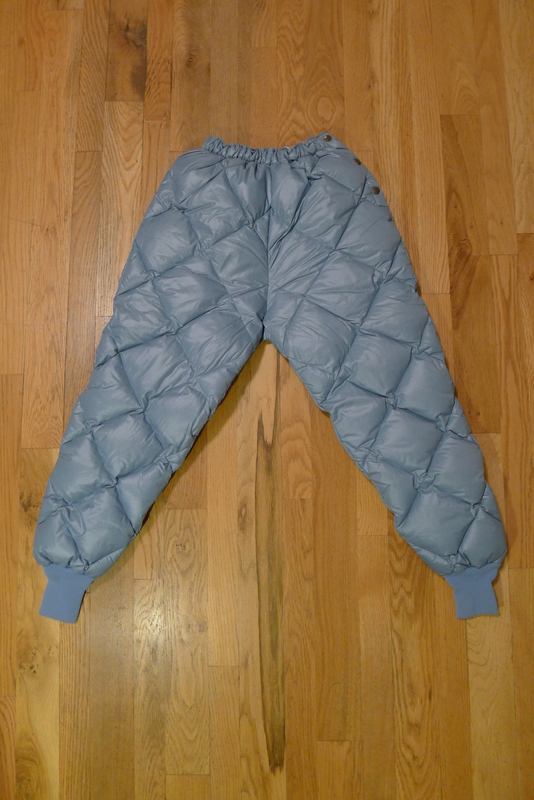 Designers also chose the use of Polargaurd for the pocket insulation as opposed to down. 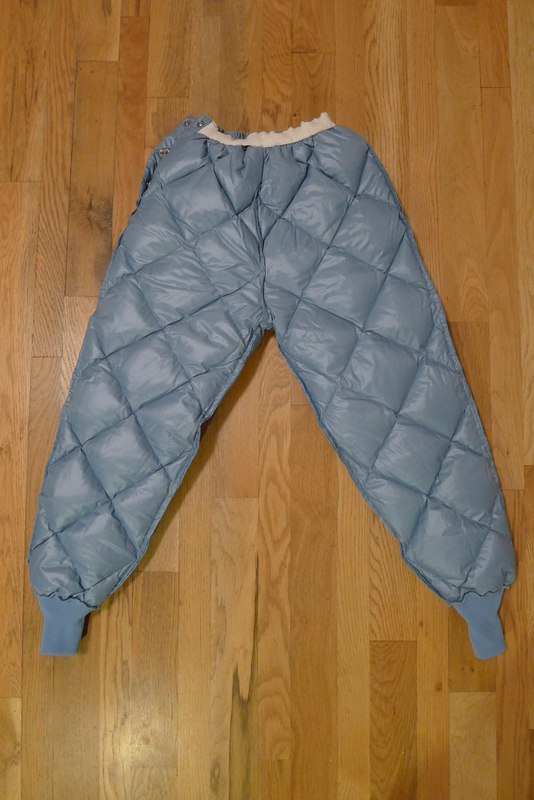 Polarguard, a relatively newer product for the period was probably seen as a more durable alternative for an often used, well-worn area. Subtle differences in the hood color, embossed snaps, which differ from the coats snaps and individual materials tag suggest the hood was a sold separately option for this coat. Carikit by Holubar Down Insulation Layer Jacket. Carikit was Holubar’s foray into the sew-it-yourself market in the mid 1970s. The name was later changed to Holubar Sew-It-Yourself Kits for stronger brand recognition with the parent company. 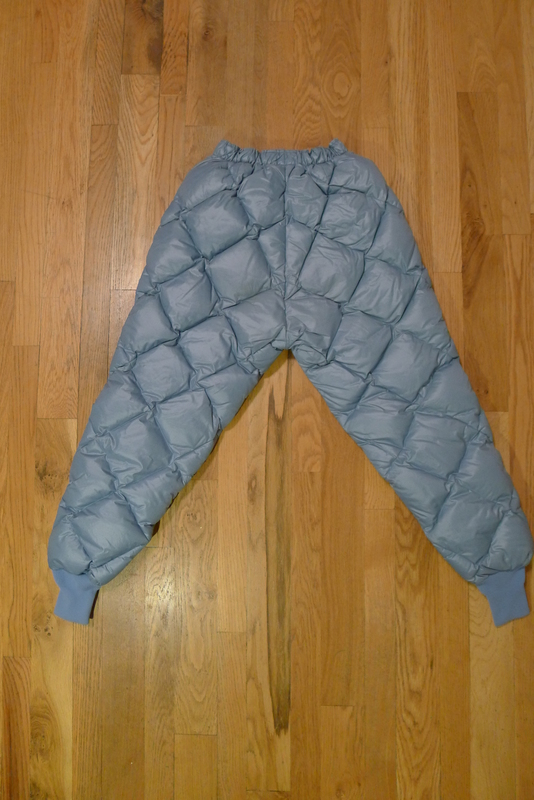 This garment could be used as a layering piece or worn as a jacket. The style first popularized by Eddie Bauer features elastic cuffs and collar. 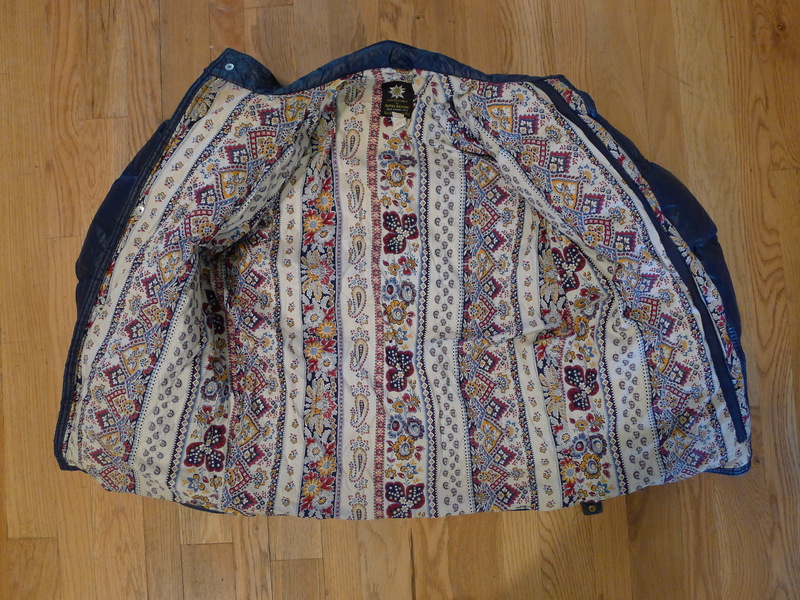 Small snaps and two front pockets. 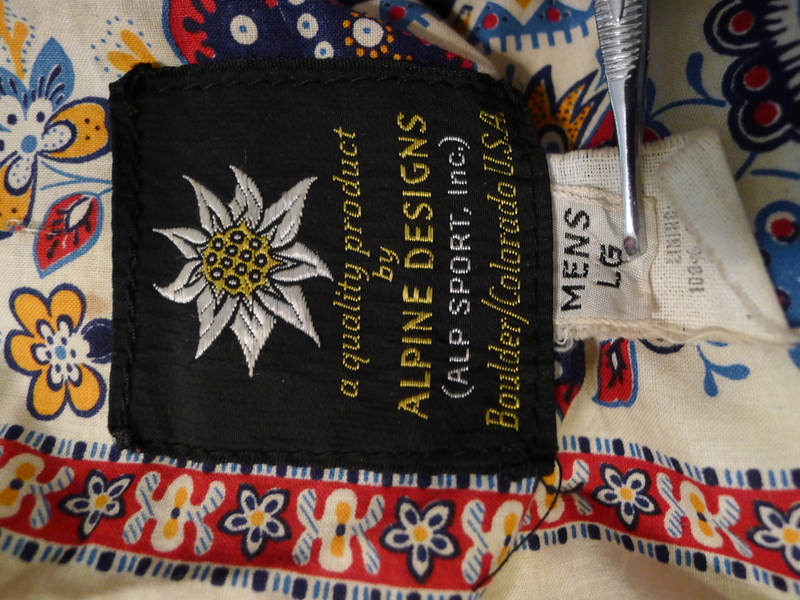 Alp Sport was started in Boulder Colorado in the early 60’s and later became known as Alpine Designs. 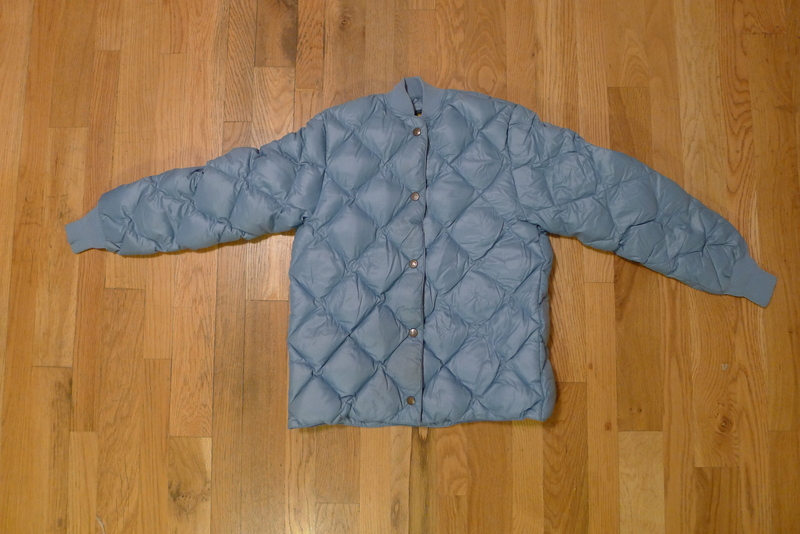 This unique jacket comes from that transitional period sometime in the mid to late 1960s. The shell is constructed from a tightly woven nylon which is light and dense, much like modern shells. 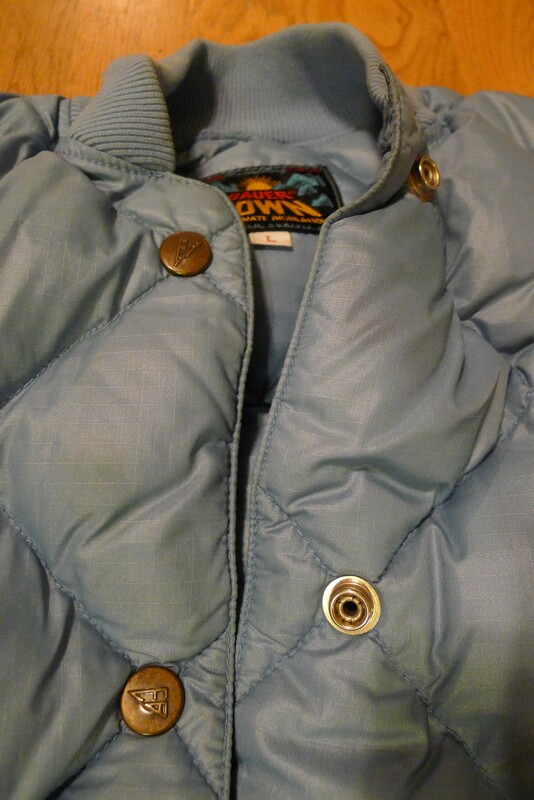 The down fill is fairly lofty, but this definitely not an expedition piece. The subtle outside gives way to an all cotton, vibrant paisley lining. Talon zippers, with Alpine Designs’ edelweiss flower logo embossed on the snaps. 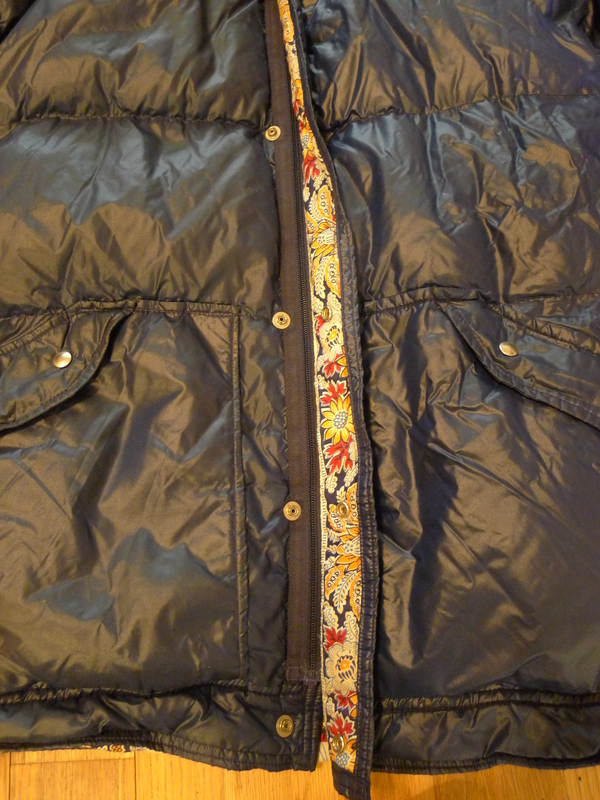 The gommeted tab suggest it could be used as a ski jacket. 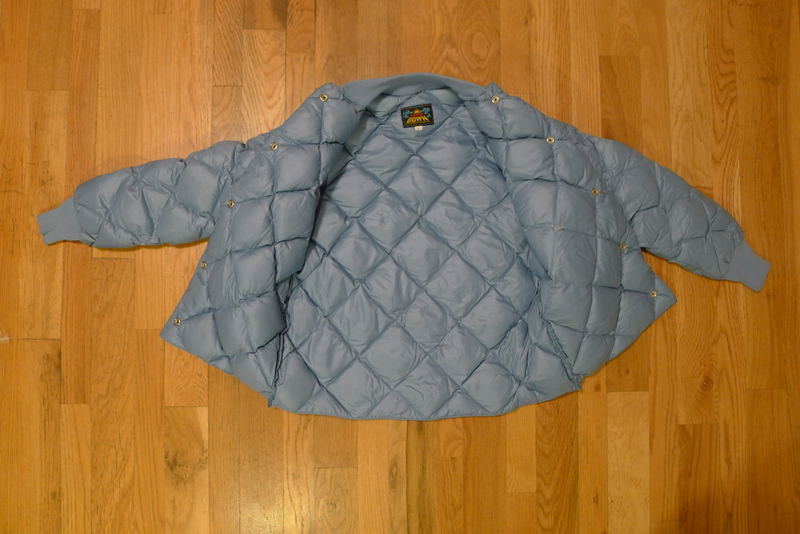 This jacket can be seen as an early example of outerwear as a fashionable piece. In the late 60s, early 70s decades of advancements in outdoor gear design started popping up on college campus’ nation wide as students embraced this new style. A sea change that helped propel companies like The North Face and Patagonia into the upper stratosphere, while giving rise to a whole new crop of labels and the eventual demise of most. 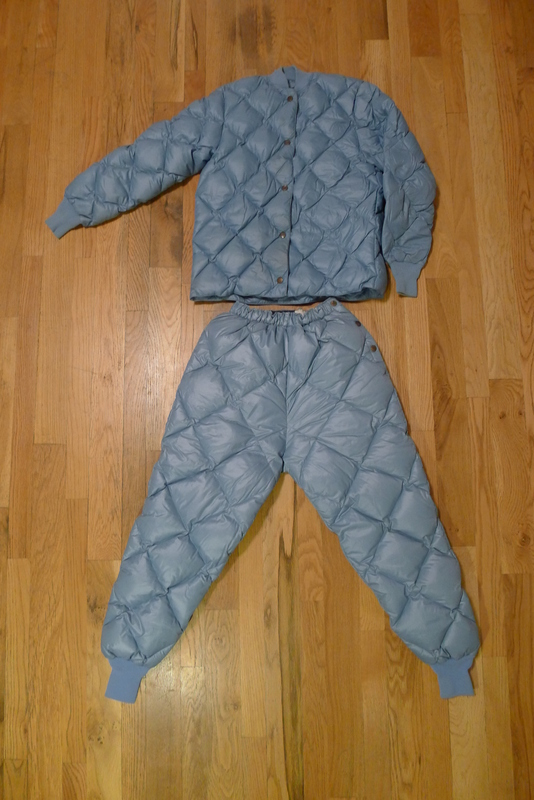 Powder blue, diamond quilted nylon houses Eddie’s best premium down with plenty of loft. 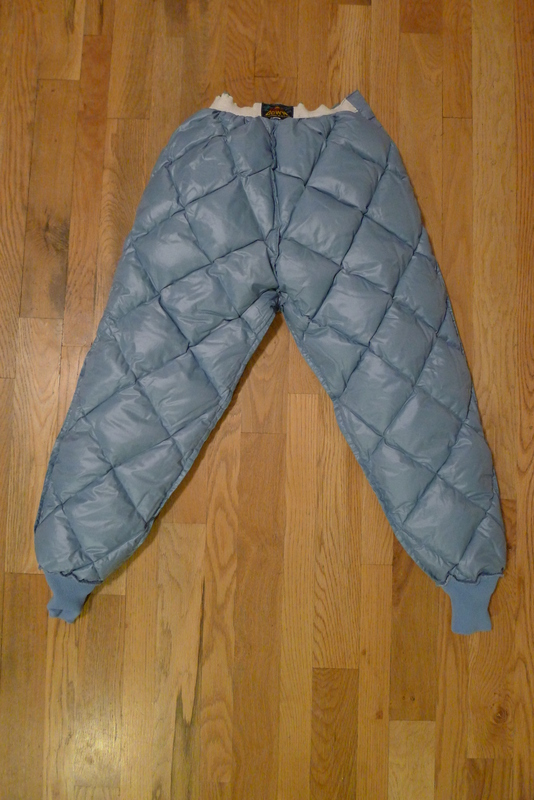 Angular EB embossed snap closer on jacket and left side pant hip. 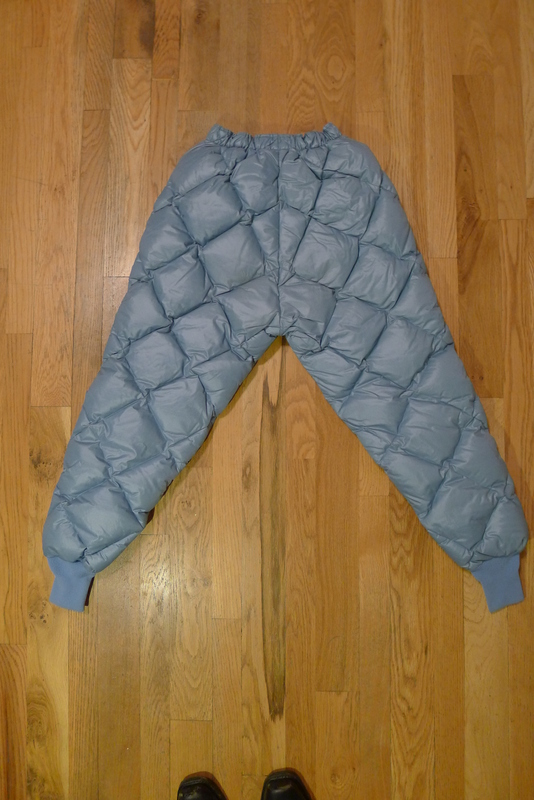 Elastic cuffs on jacket and pants with similar trimmed collar. Based on that the fact the garments are marked large and snap placement is opposite what males are used to I have deemed this a woman’s set, but it would work just the same for a male. See measurements below. 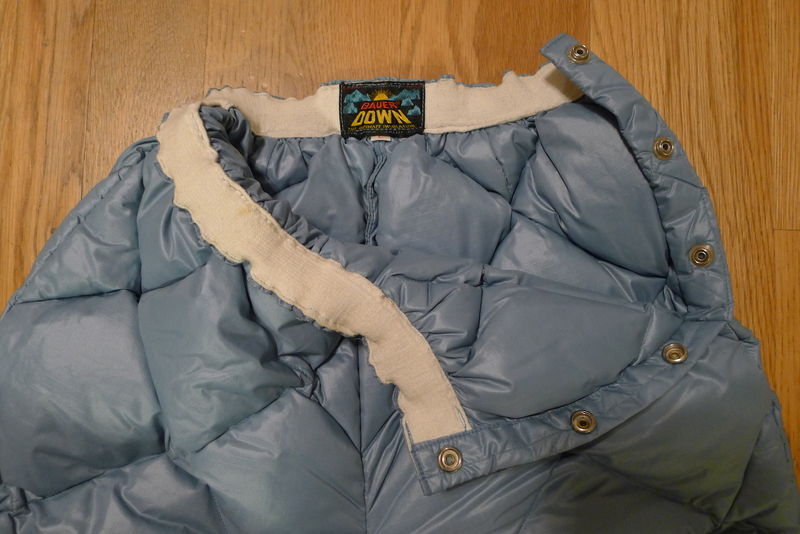 Great old EMS expedition weight down jacket. 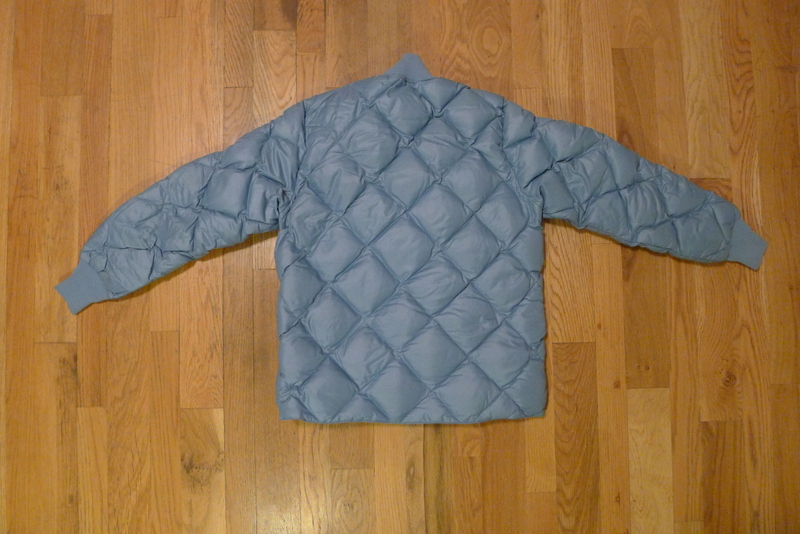 This size large jacket consists of a poly/cotton blend shell, fully lined with in nylon. 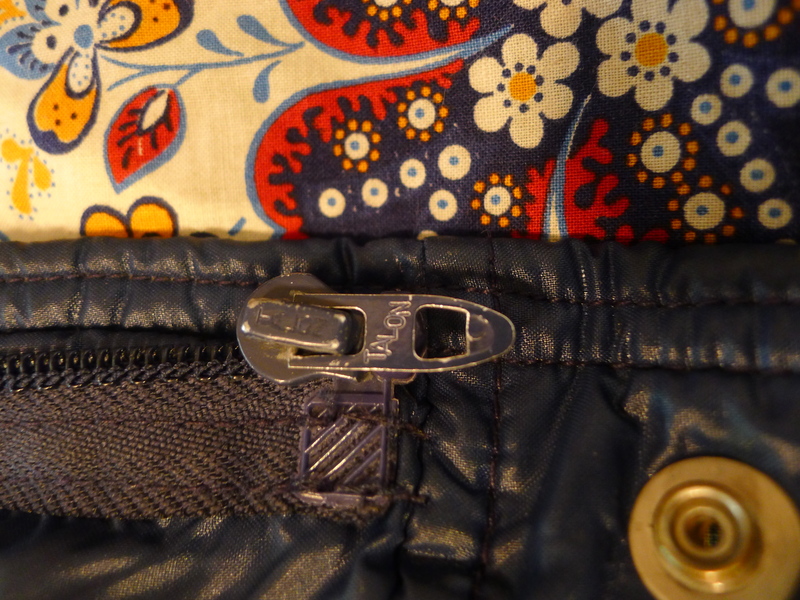 Single way heavy gauge YKK zipper and snap front closure. 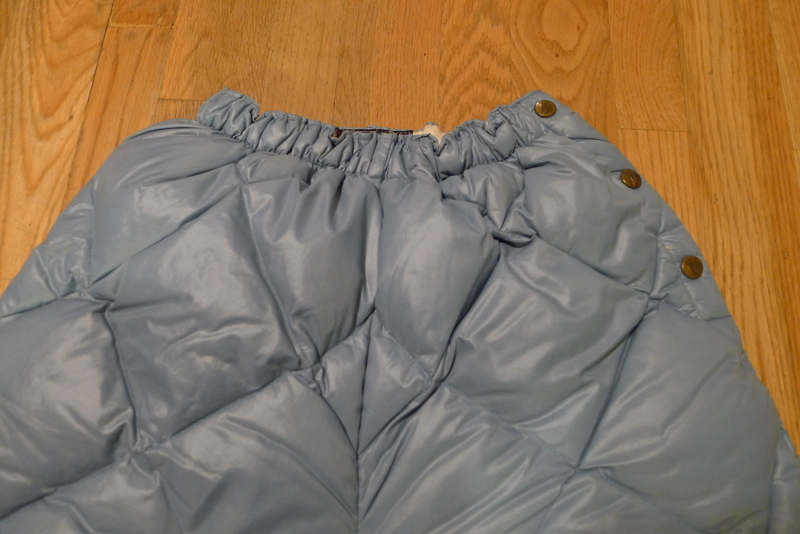 Two top and side entry front hip pockets and one large internal top entry pocket. 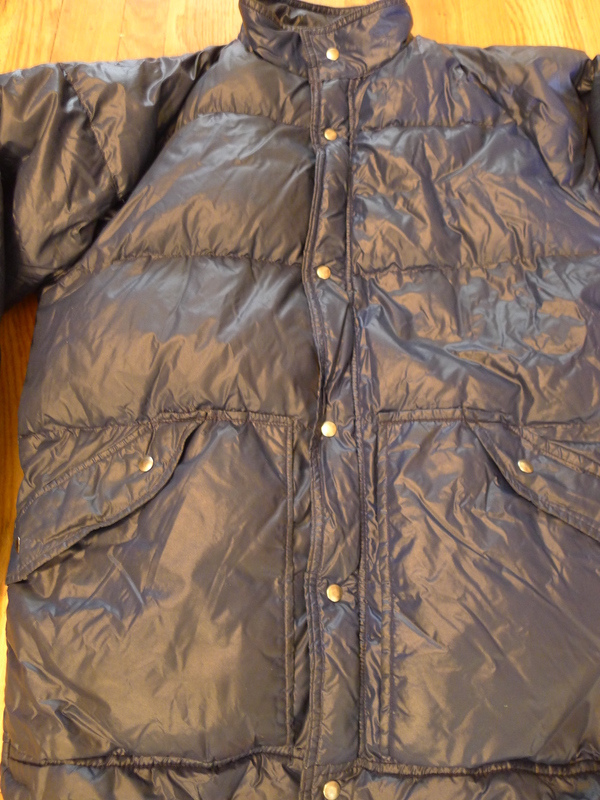 Conditionally this coat is in good shape, especially for its age. Some darkening around the inside of the neckline, while the rest of the fabric is probably not as bright as it used to be 40 years ago. It is however free of any obvious stains, rips, holes or snags. The inside nylon is in great shape too. A few little holes around the wrist leak a feather from time to time but aren’t much bigger than the stitch it would take to fix them. 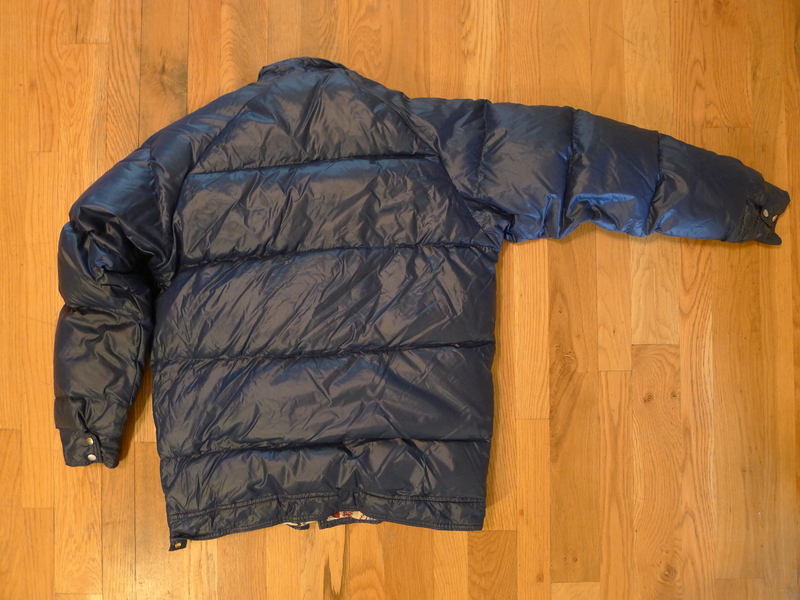 Still has plenty of well-distributed down and has been washed and is ready to wear. This is the original logo from when the company was formed in 1967. 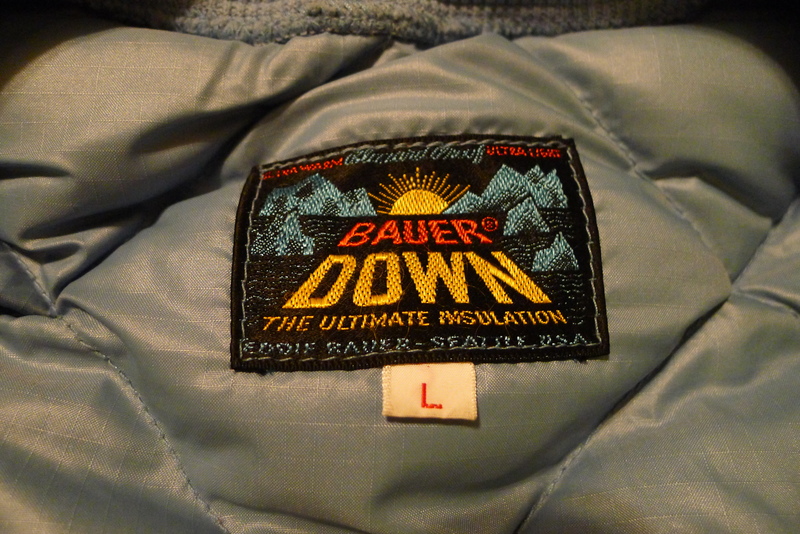 I’m not sure when the logo changed to the updated version which goes on to spell out Eastern Mountain Sports, but its a good bet this jacket is pre-1972 or better. This jacket is available so shoot me an email if interested. Sized Large, but please see measurement.